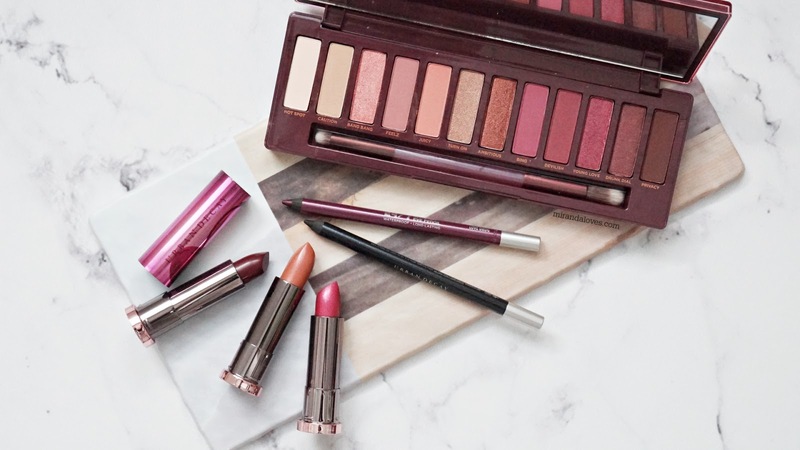 Urban Decay recently launched their Cherry palette (after retiring their original Naked Palette that was my holy grail for so many years when I first decided to seriously dive into beauty blogging), retailing for $66). It features 12 never-before-picked neutrals in a warm tone color spectrum. There are 7 mattes and 5 shimmer/metallics in total and I have them all swatched below for you! The mattes buff and blend like a dream on the lid (there is kick-off when you dip your brush in the pan but there is no fallout on the lid - so that doesn't affect me at all). The shimmers/metallics are beautiful when foiled with a setting spray. I personally found the darker hues more vibrant in tone - the ones all swatched in the right photo below. The lighter shades did well as a highlight or shadow for a halo effect. I used the shadows exactly as divided below in my two different eyelooks that I created and paired with the three lipsticks that I swatched as well. This palette can help you easily create a neutral eye look and transition into something darker and more dramatic - the full size mirror makes this ideal for travelling as well. 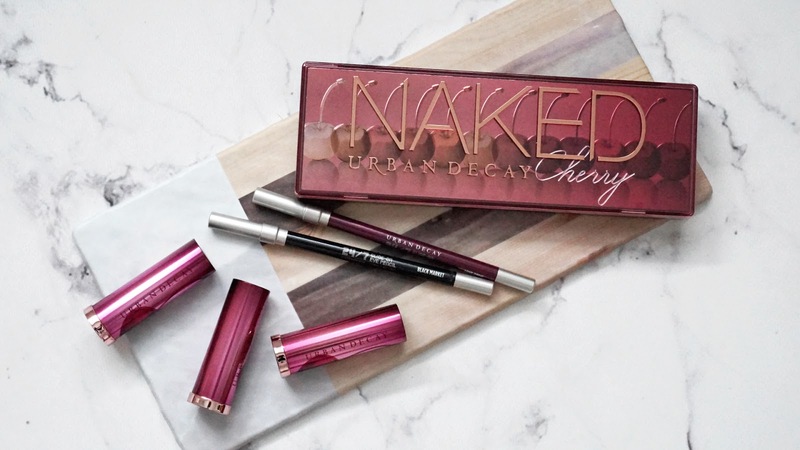 Urban Decay also created two new shades of 24/7 Glide-On Eye Pencils that pair nicely with the shadow palette. 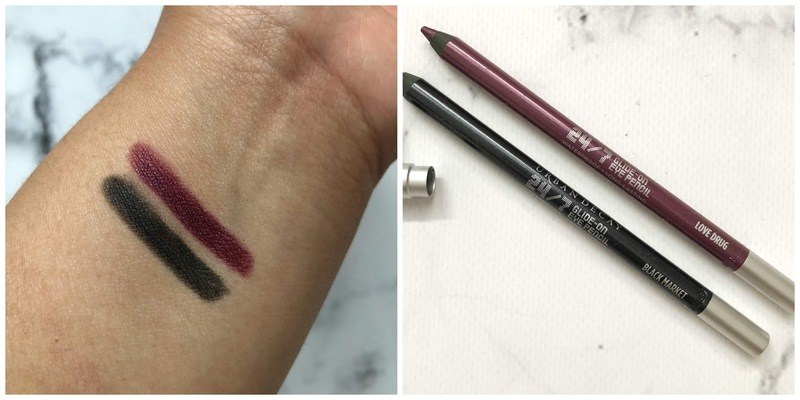 These eyeliners are the only high-end pencil liners that I go to all the time - once applied, they stay on all day and do not budge! The two shades are Love Drug - a deep wine metallic and Black Market - a black satin shade. These can also be used as a shadow base - just build it on the lid and buff out quickly before it dries, you have about 30 seconds! These retail for $25 each. Lastly, you also have three limited-edition lipsticks in two metallized and one cream formula. 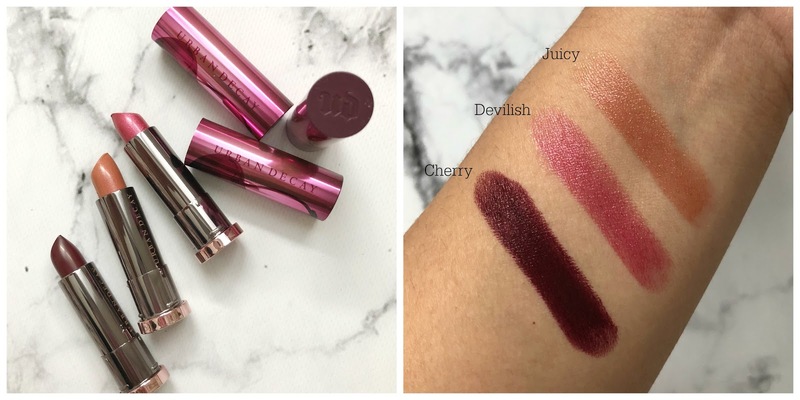 Juicy is a light peach-pijnk with copper micro-shimmer, Devilish is a berry pink with tonal micro-shimmer and Cherry is a deep berry wine. These retail for $22 each. 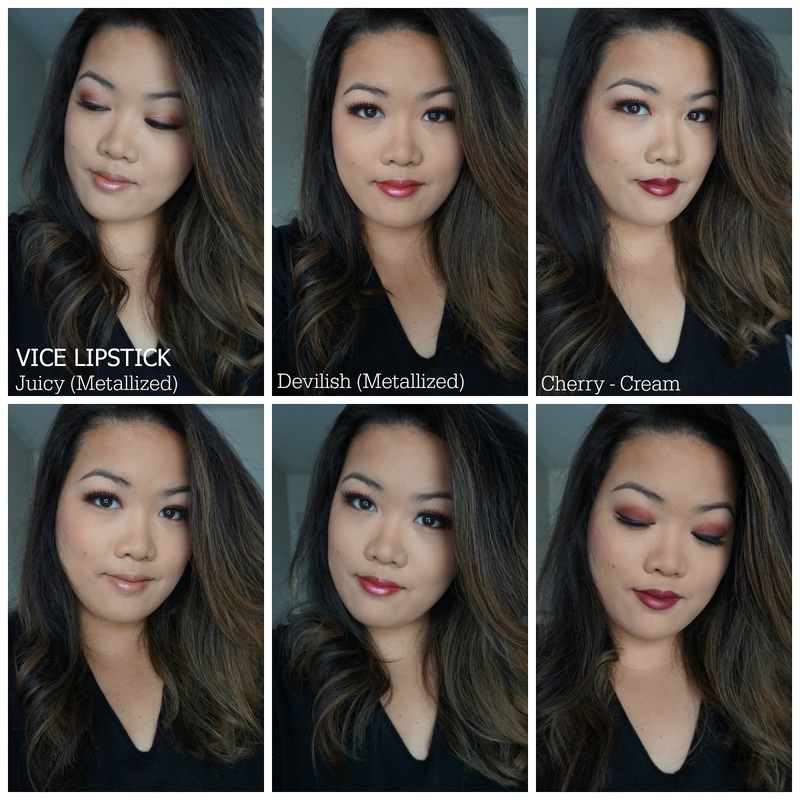 Below you will find the two looks I have created - a neutral one with the lighter palettes, more of a daytime look, on the top row and a darker more dramatic one done with the darker mattes in the palette on the bottom row. All three lipsticks are also swatched with both looks to show that they do indeed go with any eyelook you create with this palette and they really compliment each other.